Entries from Digital Intelligence tagged with "ea"
Electronic Arts is axing a controversial program that stifled trade in second-hand games. Games giant Electronics Arts has been forced to apologise for a disastrous launch of the latest version of town-planning title SimCity, offering a free game as a means of compensation. 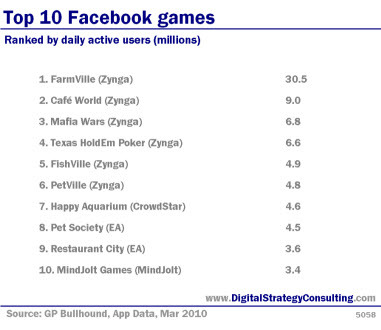 The top 10 Facebook content providers reach more than half of the total gaming audience on Facebook. 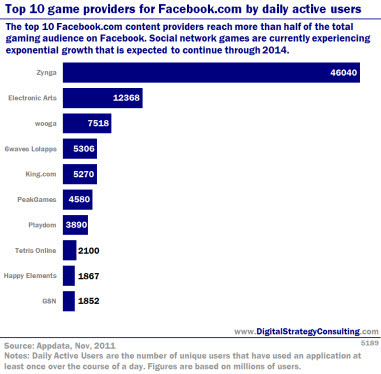 Social network games are currently experiencing exponential growth that is expected to continue through 2014. Video game publisher Electronic Arts has bought PopCap Games as the video games publisher looks to expand into the growing casual games market. The deal, worth up to $1.3bn (£817m) comes as casual games giant Zynga looks set to float on the stock exchange. EA will pay about $650m in cash and $100m in common stock for the maker of the popular video games "Bejeweled" and "Plants vs. Zombies". It could pay a further $550m if PopCap hit certain performance targets in about two years. Ranked by daily active users (millions). 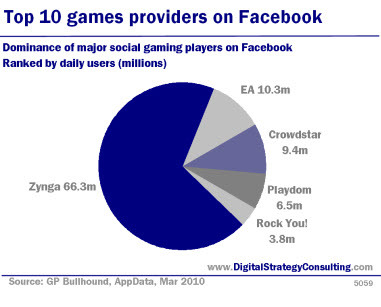 Dominance of major social gaming players on Facebook, ranked by daily users (millions).